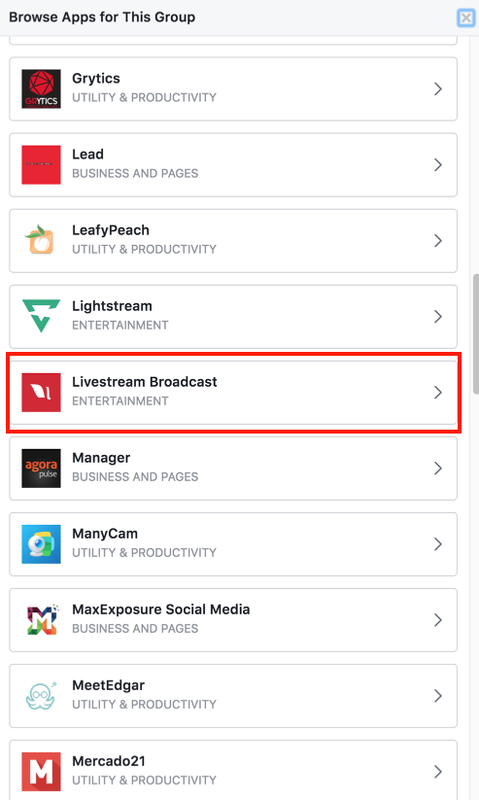 In order to simulcast your live event to a Facebook Group, you must be an Admin of the Group and need to install the Livestream Broadcast Facebook app to your Group. Once you do this, your Group will be a streaming destination option in the Simulcast settings. First, make sure you are an Admin of your Group. Only Admins can adjust Group settings and go live to Groups. 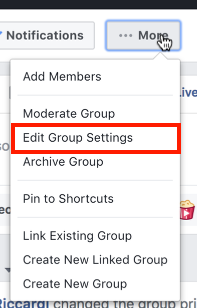 On your Group's Discussion page, open the More menu and select Edit Group Settings. Scroll down to the Apps section and select Add Apps. Find the Livestream Broadcast app in the list of apps and select it. Once you've added the app to your Group, be sure to scroll to the bottom of the settings screen and click Save. You only need to follow the above steps once. You can continue going live to your Facebook Group until you or another Admin manually remove the Livestream Broadcast app. Navigate to your Livestream account settings and open the Simulcast menu. Connect your Livestream account to Facebook. You will find your Group listed in the Stream To drop-down menu and can select it as a destination.